On Sunday, June 4th from Noon to 5pm, Observatory Hill will be bustling with visitors touring this "Neighborhood with Spirit" during the Observatory Hill House Tour. Homeowners share the story of finding a home, then redesigning it to match their own style and interests. The tour provides guests a collection of more than 10 homes each with spirited and unique personality. Tickets are on sale now for $15 by clicking the below link or $18 the day of the tour. Wear comfy shoes because most houses are surrounded by green space and streets can be a couple blocks long. The tour starts on Riverview Avenue traveling to Richey and Perrysville Avenues with a Molly's Trolley stopping at convenient intersections. From here, the tour heads further north to the Bonvue Street Revitalization Project homes. Next, guests will travel to Waldorf Street where visitors explore four homes with charm and detail that can provide ideas for their own renovations. On the eastern end, at 345 Waldorf, sit a home that will be featured in the DIY Network's Focus on Pittsburgh this Fall! More information on 345 Waldorf Street is posted at The Waldorf, A Story Of on Facebook. 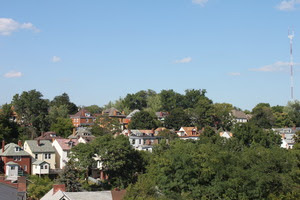 Then the trolley takes guests to Garvin Street and Franklin Road, the highest point on the tour. A special feature of this year's house tour will be samples of spirits and craft beers courtesy of Wigle Whiskey and three northside brewing companies. If you come hungry, you won't be disappointed. Four food trucks will join us during the tour so you may want to give yourself a little extra time to have lunch from the vendors. You can grab a sample or place an order as you enjoy the tour at the start of summer. Of course, the food is at your own expense. Added information about the tour and vendors will be added to this page periodically so check this site for updates. Guest will pass Riverview Park with trails, tennis, entertainment, the Allegheny Observatory and churches that serve faith communities here and beyond. They will learn about the home revitalization project close to completion on Bonvue Street adjacent to the Fire Station and the small commercial strip. While each house on the tour has its own scale and character, all hosting neighbors share an enthusiasm about the charm and the architectural character of their homes. Their can-do spirit has a positive ripple effect on the street where they live. For more information, call 412-736-2489 or email ohihousetour@gmail.com.